A Welfare Plan With a Heart! There is a better way! Why has no nation yet followed it? WHAT nation does not have to wrestle with the monumental challenges of adequately providing for its needy? Yet today's welfare programs, as a w hole, have not adequately solved the immense problems they were designed to solve. Despite the best intentions, bureaucratic inefficiency exists. Politics prevail. Standards are not always applied fairly. Then there is the problem of weeding out the cheaters. Sometimes insufficient funds plague the system. And, what is perhaps most tragic of all, large numbers of the poor to whom aid is given tend to stay poor. Though it has been too often overlooked, there is a plan that would resolve the problem of taking care of the needy. It would alleviate the great tax burdens now being imposed on society for the care of the poor, the unemployed and the elderly. It would also provide the means for most of them to improve their lot in life and eventually become self-sufficient. Even beyond the level of the individual in need, the adoption of this plan would go so far as to nullify the difference between have and have — not nations! Where is such a plan? Why hasn't it been adopted? 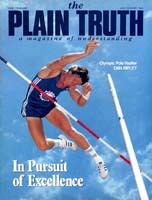 The Plain Truth magazine has pointed out for 50 years where such a plan is revealed. It is, in fact, revealed knowledge that governments need to know and could not otherwise discover for themselves. It answers the problems of all mankind. It is found in that book we call the Holy Bible. This revealed knowledge would solve the problems of caring for the poor, the unemployed, the disadvantaged. The plan is there, given in detail. Almighty God once revealed his economic and social plan to a whole nation — ancient Israel. But most of the people didn't listen. The Creator God promised the Israelites that if they would follow his plan, there would come a time when there would be "no poor among you; for the Lord will greatly bless you in the land which the Lord your God is giving you to possess as an inheritance — only if [and here is the "if' clause in the contract] you carefully obey the voice of the Lord your God, to observe with care all these commandments which I command you today" (Deut. 15:4-5, Revised Authorized Version throughout). Great national prosperity would result, "for the Lord your God will bless you just as He promised you; you shall lend to many nations, but you shall not borrow" (verse 6). No need to borrow? That's right, because they would be a have nation. The God to whom all wealth belongs would see to it. This is one of the great differences between God's plan for taking care of the needy and all humanly devised social welfare programs: God's plan alone involves his specific care to ensure the plan will work. Still, God knew in advance that ancient Israel as a whole would not keep his laws. Therefore his servant Moses predicted, as related in verse 11: "the poor will never cease from the land." It is not primarily a responsibility of big government to care for the needy, the unemployed, the elderly. It is rather an individual responsibility. Moses and Jesus taught forcibly that it is the individual's duty to help the needy (Matt. 25:34-46). "And if one of your brethren [of your nation living in your area] becomes poor, and falls into poverty among you.... " This describes many individuals in today's economically troubled times. What does God say to do in such cases? Direct the poor person to the nearest government agency where he or she might qualify for a barely sufficient handout? Where too often assistance is cut off the moment one begins to improve one's financial situation! No. "... then you shall help him" (Lev. 25:35) — you as an individual. It is the primary responsibility of the community — including the nuclear or the extended family of the poor and needy — to help their own. In addition, there must be a willingness to help those in need who have migrated to one's area in search of better opportunities — the "stranger or sojourner" (same verse). God is a generous and giving God. His laws express the way of giving as opposed to the way of selfishness, which is the way of this world. Nobody loses "friends" or even contact with relatives more quickly in today's society than those who become poor. "Wealth makes many friends, but the poor is separated from his friend," Proverbs 19:4 points out. Verse 7 adds, "All the brothers of the poor hate him; how much more do his friends go far from him! He may pursue them with words, yet they abandon him." The last thing the poor need is to be abandoned, left to languish in squalor and hopelessness. "'You shall open your hand wide to your brother, to your poor and your needy, in your land,''' God commands (Deut. 15:11). They need a helping hand to get back on their feet, or to get on their feet for the first time, to become self-sufficient members of the community. This help may include personal instruction so that the mistakes made in the past that brought on the poverty can be avoided in the future. "Blessed is he who considers the poor," the Bible emphasizes; "the Lord will deliver him in time of trouble" (Ps. 41:1). God is the Champion of the truly poor and needy. He also promises to liberally bless any who help the underprivileged. He has bound himself to repay what is given: "He who has pity on the poor lends to the Lord, and He will pay back what he has given" (Prov. 19:17). Unfortunately, in today's society, the people's responsibilities have already been preempted by human government. In addition, people who can be of help are often suspicious and hesitant about helping those who appear to be needy. There are indeed those who are poor because of simple laziness. There are those who could work, who could better themselves, but who prefer to live off handouts. Instances of welfare cheaters and social parasites have turned people away from caring for the truly deserving. But the vast majority are willing to work and better themselves if only opportunities and an added helping hand were available. God's program does not tolerate laziness and dishonesty. "If anyone will not work, neither shall he eat," the Bible declares (II Thess. 3:10). All the more reason to shift the responsibility for caring for the needy from huge impersonal government agencies, which have no way of assuring that only the deserving are being aided, to individuals who know the situations of their neighbors and who are able to keep up personal contact with them. The Israelites of old as a whole failed to properly and consistently implement God's revealed economic program. There is no record in all history of any other nation doing differently either. But God's plan will be enforced and much sooner than the nations think. It will form the basis of the economic and social structure of the world tomorrow, whether the nations like it or not. Here's how God's plan works in detail. A vital point to understand is brought out in Leviticus 25. Human families were meant to maintain an attachment to the land. Severing that tie has been a serious mistake. There's far more than a mere sentimental connection between humans and the earth. We are made out of the earth's dust. It was to belong to us until death, at which time it would become the lifelong inheritance of someone else in the family. Because individual possession of a tax-free inheritance is fundamental to God's economic system, it is obvious why no nation would allow God's program to be put into effect. But if life were lived according to God's way, each family would have a piece of tax-free land to live on or to fall back on in an emergency. This title to land would be a family's minimum ultimate worth. A person under God's system could never sell his land permanently (Lev. 25:23), but he could lease his land for a limited period of time. In the modern vernacular we would refer to this as a lease arrangement. A person who leased out his land could get it back before the Jubilee, however, if he so desired. He could repossess it anytime he wanted it by canceling the lease and refunding a fair prorated amount to the person to whom he had leased it. Thus a person could not be permanently deprived at the very least of a tax-free house and home. What a different world that will be! Of the masses crowded together in today's sprawling cities, few people outrightly own real estate. Many are renters and have little to fall back upon in hard times. Those who are making mortgage payments are only a little better off. They have some equity. But in hard times they can lose their land through foreclosure. Even those who own land free and clear can still lose it if they are ever unable to find the cash to pay the property taxes on it. The biblical plan given to ancient Israel contains numerous additional guidelines for dealing with personal economic situations. If a person leased out his land, then needed to buy it back but did not have the money to do so, he could appeal to his relatives for help in repurchasing it (Lev. 25:25). Any money that is loaned to those in need, as opposed to that which is loaned for investment purposes, was to be interest free (Lev. 25:36-37). God's program specified a seven-year statute of limitations on all short-term debts incurred by those within the jurisdiction of God's laws (Deut. 15:1-2). Think what that would mean in today's world when consumers, encouraged to go into debt and to buy on credit, are often led into financial disaster. Few lenders would be willing to extend credit to seduced buyers for luxuries and nonnecessities, if they thought they would not get their • money back before the seventh year of release! Society would quickly adopt as basic a cash-as-you-go policy. If a person, for one reason or another, fell on really hard times, or if he did not feel capable of managing his own affairs, he would not, under God's plan, face living on skid row as a useless derelict. For a seven-year period he could lease out his own inheritance and hire himself out to someone who is prospering. At the end of that period the boss is expected to be generous to him in remuneration. He could begin a fresh, independent start. But, if the servant wished, he could continue the arrangement for however many years remain until the Jubilee year, at which time he would be free and would regain possession of his inherited land (Lev. 25:39-54; Deut. 15:12-18). God's program for taking care of the needy has sufficient flexibility to provide various means of solving individual problems, all with the involvement of relatives, neighbors and employers rather than faceless bureaucratic government agencies. There are, however, occasions where help is needed beyond the person-to-person level. Situations may arise where someone in need has no relatives to help or resources to draw upon. God's program also provides for such eventualities. Every third year that the land was cultivated and harvested (which is the same as saying every third and sixth year out of a seven-year cycle, for the land was to rest on the seventh year — Lev. 25:1-7), a special tithe or 10 percent of income was to be collected. Its purpose was to provide for whoever "has no portion nor inheritance with you, and the stranger and the fatherless and the widow... [that they] may come and eat and be satisfied..." (Deut. 14:28-29; 26:12-15). That law is still in effect and those who observe it today can testify how liberally God renders his blessings in return. Under God's system the whole attitude toward sharing the wealth of the earth is far different from the greed expressed in the world today. The corners of the harvested fields are to be left unreaped and hard-to-reach ripened fruit is to be left ungathered, so that any near neighbors who are needy might find something to eat (Lev. 19:9-10; Deut. 24:19-21). There is to be no oppressing one another (Lev. 25:14). "You shall not steal, nor deal falsely, nor lie to one another.... You shall not defraud your neighbor, nor rob him" (Lev. 19:11, 13). What a world! Everyone seeking to help one another, looking out for each other's interests — that's what God wants to see. Love and concern expressed person to person, neighbor to neighbor, friend to friend. That's the attitude that shall prevail when Jesus Christ reestablishes the government of God over the earth. You might say at this point, if you are one of the poor or the needy struggling to get by on meager sustenance, That's all well and good, but what do I do under today's system? First, it should be pointed out that it is not wrong, living as we do in today's system of things, to accept whatever aid is needed and available from government agencies. Since the world is not living God's way, we can be glad that many of the needy at least have that option in certain countries. In addition, realize that you do not have to be defeated by poverty or want! Seek to better your contact and relationship with God. Put God's ways into practice in your life. Pay God his tithe. If you are willing to work hard at whatever God provides, the One to whom all wealth belongs will intervene to take care of your needs. He will "supply all you need according to His riches in glory by Christ Jesus" (Phil. 4:19). That is both a challenge and a promise. Why don't you take him up on it?